Frontispiece Cover: Sir Edmund Allenby Enters Jerusalem - from a drawing by JFC. The Canadian Fort Garry Horse of Winnipeg on the Western Front: Men of the Fort Garry Horse Who Returned After the Charge at Cambrai - Lt. Harcus Strachan (inset photo) - Officers and Men of the Fort Garry Horse Making Their Way Back From the Battle - x3 pics with captions. Views of the Gateway to the Battlefield: Australian Troops Filing Through the War Made Wilderness - Remains of An Avenue of Trees on the Western Front Known by the Soldiers as The Gateway to the Battlefield (through Chateau Wood, in the Ypres Salient) - German Prisoners Assisting Australian Troops brining Wounded From the Fighting at Passchendaele - Strafed Lorries on the Western Front - Two Australian Lewis Machine Gunners Position Behind a Shell Smashed Tree - a full page showing x5 pics. with captions. Two Soldiers Signalling Back to the Line on the Western Front - Men Repairing Cottages in France - Electric Signalling System Being Used Between the Front and Support Lines on the Flanders Front - No Mans Land Western Front and Badly Peppered Railway Trucks - The Chinese Mission Amid the Ruins of Bapaume showing Major General Kouan Hang Chang, Major Tsing Whang, Major Ho Sue, Captain Ting Chia Chur, Capt. Wei Tsang Ki, Capt Tegurkia Gen - A full page (fp) showing x5 pics. with captions. Partly Completed Strong Point Captured by British on the Cambrai Front (wire mesh construction) - French Wireless Near Firing Line - M. Clemenceau the French PM Visiting miel Troops on Le Mort Homme Battleground near Verdun - A French Gun Position on the Meuse - Battery of French 4•8in Guns in the Neighbourhood of Curlu, Somme - A fp showing x5pics. with captions. Loading a French "Thunderer" Gun Into Position Before Verdun - The Thunderer Gun at the Moment of Firing - A fp showing x2 pics. With captions. East Africa From a German Camera: German Officers Setting out for the Trenches in E. Africa - German Askaris Behind a Zarebga Made of Loosely Filled Sandbags - German Officers and A Native Field Company - x3 pics., with captions. On the Cambrai Front: British Staff Captain During a Surprise Onrush of The Germans, Attacking a Guard - Between Marcoing and Masnieres a Colonel of the Die-Hards After Being Severley Wounded in the Right Eye, Encouraging His Men to Hold On to the Last - Sir Julian Byngs Victory nr Cambrai with the Tanks and Men Moving Forward and Germans Fleeing - A Wounded Young Cockney Keeps His Wounded Comrades in Good Spirits - x4 pics. on a double page from drawings, two signed by AW; with captions. sleekburnc. British Troops Seconded From Yser and Somme, to Brenta and Piave: Italian Artillery Marching Along a Road Screened with hangings and Ceiled in to Hide Military Movements - Italian Children Flocking Around a British Regimental Field Kitchen to Watch the Preparation of the Mens Midday Meal - Cantonments at ARcole in Verona - British Soldiers Enjoying the Scenery in Italy - British Reinforcements Passing Through an Italian town - A fp showing x5 pics., with captions. The Kaiser as Patron of the Prince of hell: Kaiser i the Uniform of a Turkish Field Marshal. - Kaiser in Conversation with General von Woyrsch Outside a Train. 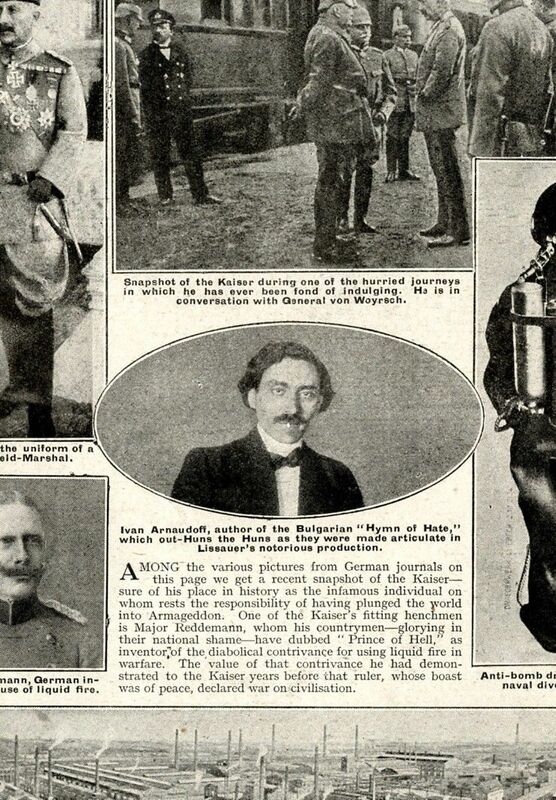 - Major Reddemann the German Inventor of the Use of Liquid Fire, - Ivan Arnaudoff Author of the Bulgarian Hymn of Hate Which Out-huns the Huns - Anti Bomb Dress of Germanys Naval Divers at Ostend. - Huldschinsky Sector of the Great Griesheim Chemical Factory near Frankfort Destroyed 22 Nov (before pic) - A fp showing x6 pics., with captions and small article. c.keenlyside. Airship that Searches the Sea for Submarines: ON Board a French Dirigible - x3 pics., and captions. Forcing the entrance to Palestine at Gaza: British Yeomanry with Captured 5•9 Howitzers, Being Harried by the Turks, After The Capture of Gaza - British Patrols Entering Gaza - x2 pics. with captions. American Engineers Aid British Guards: Ulstermen Place Captured Helmets on their Heads to Pose for Photos - ON of the Welcome Huts at Cayeux, on the Western Front reive - Officers of the USA Railway Engineers - 8in Gun Captured by Highlanders - Large Party of USA Railway Engineers at work near Gouzeaucourt, France - x5 pics., with captions. Land Girls: tractor Ploughing in a Womens Farming Competition near Maidstone - Women Sparaying an Orchard i the Womens Agricultural Competition near Maidstone - Women Fixing a Tractor - Women Land Workers Setting Out for the Various Competitive Tests at Allington, nr Maidstone - Pruning Trees - A fp showing x5 pics. with captions. Sgt J. Molyneux VC - Royal Fusiliers. Sgt W. F. Burman VC - Rifle Brigade. Private Charles Melvin VC - Royal Highlanders Black Watch. Lance Corporal H. Mugford VC - Machine Gun Corps. Private F. G. Duncox VC - Worcestershire Regt. Dr Elsie Inglis - Commissioner of the London Units of the Scottish Womens Hospitals. Sister Dorothy Laughton M.M. Territorial Force Nursing Service. Pte M. J. O'RourkeVC Canadian Infantry; Sgt J. Ockenden VC, Royal Dublin Fus; Pte W. H. Butler VC West Yorkshiore Regt; Cpl E. A. Egerton VC Sherwood Foresters. Sgt Joseph LKister VC - Lancashire Fusiliers. Pte. Albert Halton VC - Kings Own Rifles Lancs Regt. Private Arthur Hutt VC - Royal Warwicks Regt. Cply Filip Konowal VC - Canadian Infantry. Capt. J. W. Hart MC And Bar R.W. Surrey Regt. Coy Sgt. Major Robert Hanna VC - Vancouver Regt. Cpl. Shotter MM and Bar RGA - Killed. Cpl R. Fowler DCM - Border Regt. Capt J. F. McG.Sloan MC and Bar RAMC. The page also shows an article above the photos which runs to approx. 380words with refs. to Private Michael O'Rourke - Harold Mugford - William Francis Burman - Elsie Inglis - Dorothy A. Laughton. A fp showing an article by Lovat Fraser covering: Wearing Out Germany - OUtlook in Russia - Pan Islamic Movement - Rationing and Man Power. A fp by Hamilton Fyfe on his experiences of being arrested three times as a spy while reporting in Russia. War Time Wages and Prices; Their Causes and Effects of their Simultaneous Increase - fp by Jesse Quail with paragraphs headed: Increased Incomes of Workers - Analysis of Enhanced Prices - Tests by Index numbers - The Government as Profiteer. 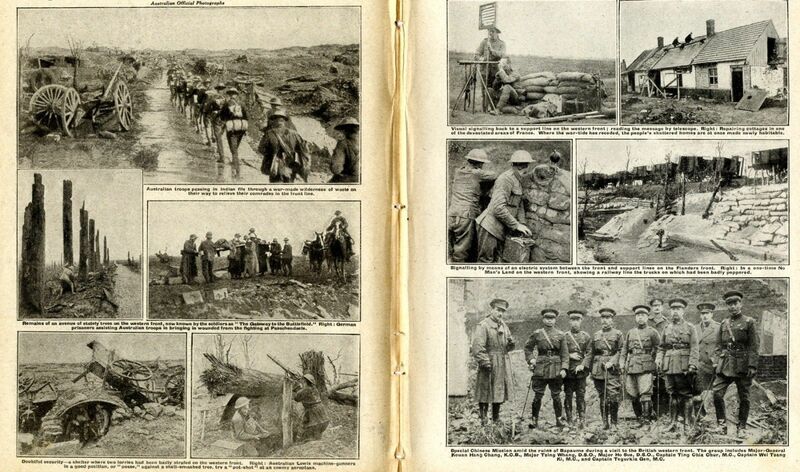 First issue of the new year, this 1918 WW1 magazine contains lots of images. An original used issue, not printed on the best of quality paper, but it more than makes up for this in terms of written content with many images. The four digit number in brackets in title is for my ref only. 10 pages (20 sides). It measures 285mm x 220mm (11.25 x 8.5") approx. Spine is loose with binding witness marks. There is age yellowing/toning and some marking. Some creases etc to corners and handling marks to edges. Images, photos sketches etc. vary in size. PLEASE NOTE: I cannot guarantee that the issue is complete 'as published' - but what I have described above IS present. The outer cover is missing; but as far as I can tell there are no other pages missing. If you're looking for something in particular in this issue PLEASE ASK. If you require information on size of articles (i.e. number of words), sizes of images, please ask before bidding or buying. This item will be packaged in a board backed envelope. The descriptive text in my listing, details the content in my words and not necessarily what is written on the original page. "Info." in the description is my research, although relevant to the accompanying image or article, is not necessarily in the text.